Home/Big Challenges to Education, Innovation in Education, Leading Change, Strategy and Vision, Uncategorized/How Will Our Ideas and Practices Evolve? Education is a mirror of societal interactions. For millennia, knowledge and information have been vastly more “push” than “pull”. The big ideas of a few rulers, politicians, philosophers, celebrities, scientists, artists, authors, and the like have molded the evolution of human thought and action. In logarithmic terms, the 10 have led the 100,000, or perhaps the million. A BIG question we face is, “does this relationship still hold”? 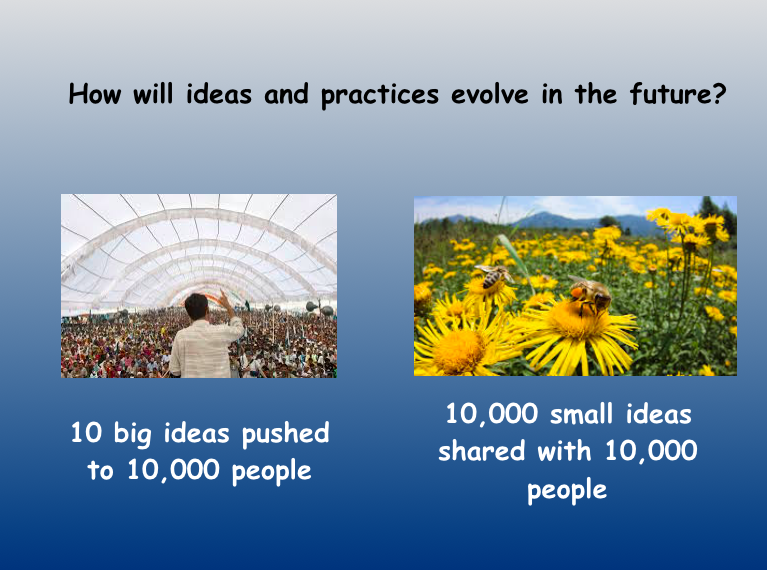 Will ideas and practice evolve “better” and more efficiently by finding new ways to more effectively push the big ideas of the metaphorical “10” out to more people, faster? 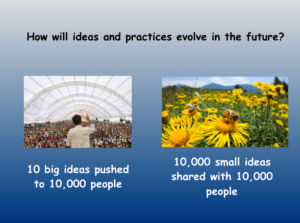 Or will ideas and practice evolve “better” and more effectively by sharing the knowledge and insight, perhaps the little ideas, of 10,000 people amongst those same 100,000, or perhaps a million or a billion? The first model says that the queen bee is the repository of the future of the hive; she holds, after all, the genetic currency of the hive. The latter says that the worker bees hold the future of the hive; they know where the honey is and can communicate the needed vectors to all of the other bees, without which the hive starves. Everywhere I turn I find really smart people arguing that the latter is both better and inevitable. I think if schools are going to serve our children well in the future, school leaders have to decide where they lie on this continuum.